Yet, given its effectiveness in nearly every body system, statistics show you probably aren’t getting enough of it. Research suggests that as much as 57 percent of the population doesn’t meet the RDA of magnesium every day. And, to make matters worse, your body’s absorption of this crucial mineral decreases with age. Magnesium is a mineral that plays many important roles in human health. The adult body contains about 25 grams of magnesium, with more than 60 percent of total body magnesium found in the skeleton, and about 27 percent is found in muscle. Approximately six to seven percent can be found in other cells, while less than one percent is found in the extracellular matrix, the part of the cell that provides the structural and biochemical support to the surrounding cells. 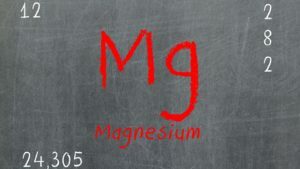 Magnesium plays structural roles in bone, cell membranes and chromosomes, and is also needed for hundreds of metabolic reactions. For example, many magnesium-dependent chemical reactions are required to metabolize carbohydrates and fats in the production of adenosine triphosphate (ATP)—your cell’s primary energy source. Magnesium is required for the synthesis of nucleic acid (DNA and RNA), protein, carbohydrates and lipids. It is also needed for the synthesis of the antioxidant glutathione, which plays a key role in detoxification. In addition, magnesium is required for the active transport of ions like potassium and calcium across cell membranes for the conduction of nerve impulses, muscle contraction and normal heart rhythm, for cell signaling and for cell migration, which may be important in wound healing. That’s a dangerous trend—because magnesium might actually be the most critical supplement in your arsenal.